Guest Post: Hi, I’m Bernard, a climber and big fan of professional comps and I wanted to share my experience watching the best event of the year. This years Legends Only climbing competition took place this weekend and the participants were different than years past. They were all women. Normally only men are allowed to compete in this invite-only event but organizers made a refreshing choice in 2015 by giving female climbers the opportunity to participate in this exciting format. The competition itself is very different than traditional world cup style events. Not only do the athletes have the chance to try all the boulder problems ahead of time but participants and route setters are interviewed during the competition. Also, the problems are hard. Really hard. Take at look at British bouldering champ Shauna Coxsey trying the first boulder. Although many of the athletes struggled on the dynos and crimps, one of them didn’t. 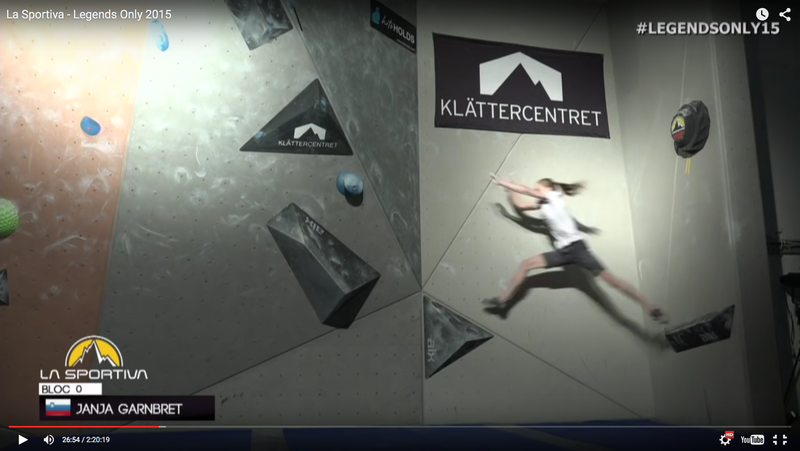 Watch as Janja Garnbret of Slovenia tops problem 1 with ease. The trend continued for the 16 year old climber. The route setters challenged the climbers with steep angles and dynamic movement. A style more often seen in boulders designed for men. This is her second attempt on problem 2. Janja shows the maturity of a much older athlete as you can see she moves deliberately and shakes out whenever the position allows, a technique often employed by lead climbers, which she is. Here she sends problem 3 on her second try. At this point while I was watching the competition my only thought was “Can she win?” I still had doubts despite Janja’s extraordinary performance because the other competitors are crushers at the highest level, notably Anna Stohr with a total of 20 world cup bouldering gold medals. Then Janja did what she does so well. Send. …Despite her foot slipping partway through the route. After completing problem 4, the final boulder was just a formality as Janja had already won the competition. In this clip the age difference between her and the other climbers is apparent. I’d love to interview you for a piece in YAM magazine. Could you email (address supplied in details) and I’ll let you know the particulars.